However, the sad part is that a lot of people often do not pay attention to ToS. Most websites, such as Google and Yahoo have a long list of terms and conditions that people often end up accepting without even sparing a proper glance to the clauses mentioned in them. This is a common practice everywhere, mainly due to the fact that people consider going through a huge list of policies a waste of time. Nevertheless, this behavior can be really dangerous as the failure to properly read the ToS can cause big problems. When you join a website or hire the services of a company, a contract is said to have been signed between the two of you. When you sign or accept their policies, it is assumed that you have gone through them and are required by law to follow them in all regards. 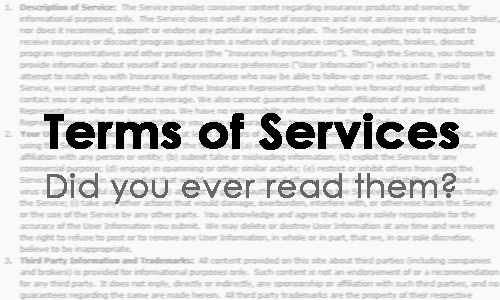 In most cases, when people fail to properly read the ToS, they run the risk of getting into trouble due to their neglect. Take as example an ecommerce website that allows sellers and buyers to easily buy and sell their used products on one platform. When a buyer or a seller joins such a website, the website will generally require them, to approve its ToS in order to be a member. Say the user neglects the points in the ToS and approves it, not knowing what exactly is in the contract. The seller gets in touch with a buyer and sells a product for $50 thinking he would make a profit of $5 on it. The seller is happy because he knows that he has sold the product while sitting at home and the money he will receive is guaranteed. However, he receives only $45 in his account instead of the assumed amount of $50. This is when the trouble begins. Such problems are pretty common and a great number of people have to deal with them on a regular basis, only due to their willful neglect. Say the seller failed to read the policy that highlights the fact that the company will charge 10% of the selling price as commission. Hence, the seller only received $45 after the deduction. This may cause a loss to the seller because the profit he expected on the sale has been lost. This example clearly highlights how ignorance can cause big trouble. If the seller had gone through the ToS, clearly he or she could’ve charged a little higher to make some profit. In the same way, there can be other kinds of losses as well. Many users lose their accounts on websites due to the failure of abiding by the ToS, which they do not even go through. In order to be on the safe side, it is important that you read the ToS, or at least glance over them briefly, before giving your approval. You cannot really comply with the policies until you know them.